Chiarelli also recalled in the interview that the Personnel Contingency Cell in the AOC had been tasked with putting together a new mass casualty standard operating procedure (SOP) for the Army. About a week before 9/11, Chiarelli said, a colleague of his--"Robby Robinson"--and two other officers "came in to brief me on their new SOP for mass casualty." Chiarelli did not specify in his February 2002 interview what type of aircraft was envisaged hitting the WTC in the scenario. Nor did he say whether it would have been a hijacked plane or one that crashed into the WTC accidentally. But what his account means is that, in the days before the terrorist attacks in New York and at the Pentagon occurred, a military exercise was being planned that was scheduled to take place less than a week after September 11, with a scenario that was identical--or at least extremely similar--to what happened in New York on 9/11. The possible significance of Chiarelli's training exercise being based around a plane crashing into the World Trade Center will need to be determined by a new and unrestrained investigation of the 9/11 attacks. However, the odds of this being due to chance, and unrelated to what happened on September 11, must be minute. The AOC that Chiarelli was in charge of is located in the basement of the Pentagon, two levels beneath a parking lot. It plays an important role within the Army. Reportedly, "Critical information flows through the high-security worksite, with AOC personnel--almost all in uniform--working day and night to keep senior Army leaders aware of issues and events around the world, helping them make timely, critical decisions." Chiarelli described the AOC as "the Army's command and control center." On September 11, senior Army leaders assembled there in response to the terrorist attacks. Pete Chiarelli, interview by Frank Shirer. 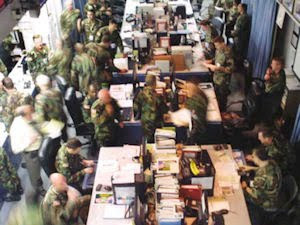 U.S. Army Center of Military History, February 5, 2002. However, in an interview with Chiarelli's deputy, Brigadier General Clyde Vaughn, Army Center of Military History historian Stephen Lofgren mentioned that the exercise was scheduled for "a couple of days" after September 11, meaning September 13. See Clyde Vaughn, interview by Stephen Lofgren, U.S. Army Center of Military History, February 12, 2002. It is unclear which date for the exercise is correct. Alfred Goldberg et al., Pentagon 9/11. Washington, DC: Defense Department, Office of the Secretary, Historical Office, 2007, pp. 134-135.